If your goals are not achievable you can use them as targets. Sounds like a strange proposition? Well, look at Microsoft – everyone and their brother love to use it as a target of hate, criticism, etc. It’s human nature – to consider success of others as own failure. Fortunately, Microsoft never ceases to offer opportunities for harsh and well deserved criticism. As it turned our recently launched Microsoft service Juku borrowed much more than inspiration from Plurk, it used very much everything including source code. Initially Microsoft seemed uncertain about what happened yet shortly after the news hit the blogosphere suspended Juku and issued apologies to Plurk. “Because questions have been raised about the code base comprising the service, MSN China will be suspending access to the Juku beta feature temporarily while we investigate the matter fully.” see more here. I am sure that we’ll never know exactly what exactly happen. In my opinion the chances are that Microsoft outsourcing partner did something that we call R&D – rob and duplicate, and under pressures of budget / timelines / etc. did not even make efforts to cover its tracks. The theft most likely happen at a very low level of the food chain – maybe just a few developers removed from the MS headquarters by 100s of layers of corporate hierarchy, maybe a product manager making a misleading request “make it like Plurk”, it might have been simple translation error … never the less the giant company is now have to accept responsibility for the mistake that in its relative size to the company decision volume would be equivalent to a drop of water in a sea. I would not even attempt to put a price tag on this debacle… well someone in MS will have to. Anyway, there is an important lesson here: do you know what your vendor is doing? Do you know whether code came from? Was there any lines borrowed from a competitor, innocent bystander, or open source? That issue is relevant to all your employees (something borrowed from a prior employer? 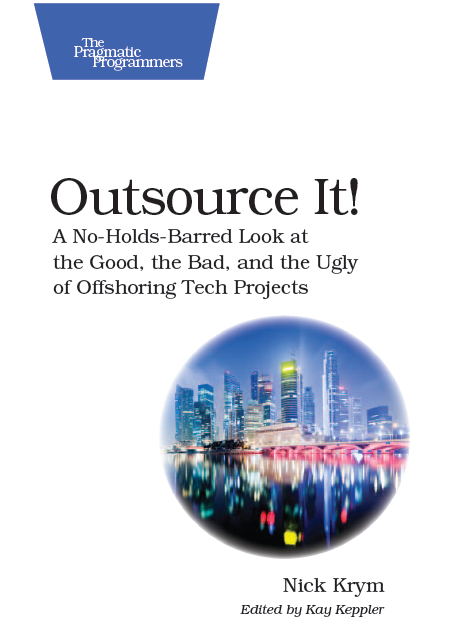 ), yet by far is much more serious when it comes to outsourcing. I came across it on multiple occasions – from code to “research” produced by consultants. In many cases finding plagiarism was not difficult, I am sure that in many cases I missed it as well, especially if the contributor was smart enough to remove comments, or paraphrase. As you can see from MS example that issue is of very serious of nature and should be of grave concern. Make sure that you educate your team and include plagiarism analysis in your code review process, at least on an occasional audit basis. A few days ago starting from a comment to my post I found a very interesting discussion of metrics on 360° Vendor Management. In his post Tony covered a few golden rules that are important to consider when introducing metrics in vendor management. I agree in general with most of the principles covered in the post and highly recommend looking at it as well as other materials publish in the blog. A Master Service Agreement (MSA) is intended to create a contractual framework for relationships between parties involved. Unfortunately way too often MSAs are used to protect intentional incompliance with a spirit of the agreement. When MSA is written and negotiated the parties bring to the table their knowledge of the domain, in this case offshore outsourcing services. The party more experienced in the space can predict certain behaviors and relationship patterns and appropriately protect themselves from liabilities they bring. More so that party can take advantage of less experienced negotiating partner and create an invisible cloak that will be used to hide issues and drive higher profit from the contract. As a service provider I know that customer is likely to be late on their deliverables and my team would be spinning wheels waiting on those deliverables. To protect myself from that potentially serious issue I will put a clause in MSA that would state that if I am waiting on the customer I am still getting paid. That’s just fair, isn’t it? Now, consider what I can do during negotiations – I can downplay the probability of customer delays (most likely using customer’s ego) and shape that clause in a manner that gives me a lot of flexibility. Then, when the opportunity presents itself I can induce waiting period and rip the benefits that already embedded in the MSA. Another, probably most common area, is related to provider dealing with the resources on their side. There are many areas where supplier can negotiate “reasonable” terms that have nothing to do with reality of the situation. For example, if a software developer quits another developer would be put in his/her place and ramp up period should be the industry’s standard 2 weeks. Industry standard? When I bring onboard a new developer it takes 2-3 month for him / her to become fully productive how come it takes four times less with an offshore guy? That’s not the point though, no matter how many weeks of shadowing you might negotiate the realities of delivery against the item in MSA remain practically unknown, and thus could be manipulated to fit provider’s objectives. In general what makes an MSA an invisibility cloak is not bad intentions of the vendor, but buyer’s inability or lack of desire to enforce it by staying on the top of engagement. If you do not control the deliverables each step along the way, if you do not verify timesheets and assignments, if you hope that the MSA will prevent me from issues and problems of malicious or delinquent nature you will most likely fail. In that case the MSA will become opaque and impenetrable defense mechanism for the vendor. I guess Invisibility is in the eye of the beholder. Steps to making an MSA transparent are obvious – focus on execution, control of deliverables, etc. Considering an example of team turnover. A realistic ramp up for a developer in terms of productivity would be 25% first month, 50% second, 75% third and 100% from that point on. In that case over 12 months developer produce 1050% of the monthly allocation. Suppose a developer quits after 6 months and spends one month training a shadow resource (it’s reasonable to assume that that between two of them productivity for that month is 100%). In that case total productivity over the year will be 975% or ~7% less. If we have two replacements over the year the figures would be 900% or ~14% loss of productivity. That could be easily translated to the rate impact – if your rate for the developer was negotiated at $25 per hour in the second case you paid roughly $27 and $29 in the third. Of course not controlling these figures makes the difference invisible… The magic spell to make the cloak transparent would include linking turnover baseline to rate and more important watching it over the case of the engagement.